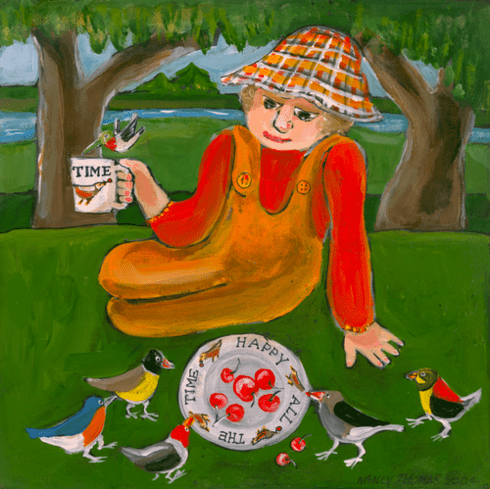 Happy all the Time Iron Framed Wood Plaque with hand-painted cherry topper by Nancy Thomas Measures 8"sq (metal topper not included in measurement) Please note the image does not show the cherry topper which is included. Frames are hand-cut and painted, and the metal toppers are individually painted by hand. Next, the prints are hand-assembled, one by one with care and attention to detail. Nancy Thomas Gallery products are proudly handcrafted and assembled in the USA.